Sign of SASHA Farm, located in Manchester, MI. One of the major reasons behind the veganism movement is the treatment of animals. Some animals raised for food are viewed as products to the farmers they are under, and many are in situations where they are poorly cared for and sometimes left to die. 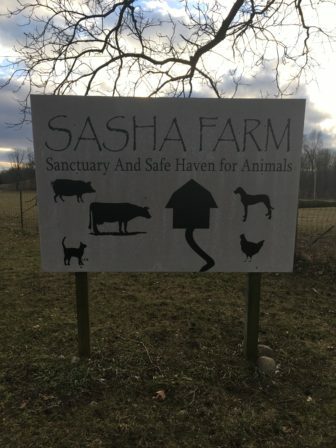 The Sanctuary and Safe Haven for Animals Farm, otherwise known as SASHA Farm, is where some of these animals end up when being rescued from those situations. SASHA Farm’s website says the farm shelters close to 200 animals, but animal caretaker Brece Clark said it “might be pushing 400 now” after recent additions. When the farm first opened, Clark said, there were only a handful of goats, which has since expanded to a variety of animals coming from different places. “Every one of these animals were in a situation where they were not being properly cared for or had been abandoned,” said Clark. Bhima is a Gir Ox from India. Although SASHA Farm is located in Manchester, Michigan, it acquires animals from all over the country, and even one animal from India. Not long ago the farm took in pigs that suffered from the flooding that occurred after Hurricane Florence in North Carolina. The farm relies on people to call in and explain situations where animals are in danger, and from there they can evaluate whether or not they can take them in. 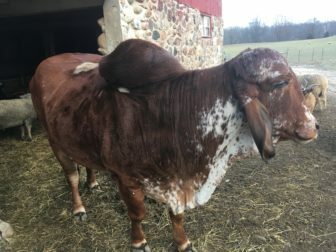 Some of the animals have traveled from traumatic situations, and SASHA Farm volunteers try to make sure that they are as comfortable as possible when easing in to the new scenery. “The space alone is one of the best things we can offer them. Usually they’re coming from places where they’re so confined,” said Clark. “Gradually we introduce ourselves to them, we don’t push ourselves on them. The friendliness part, that is of their own choosing. You can see they blossom into a trusting animal because it’s something that they want. LANSING — Michigan’s wine industry is thriving, with more than 125 wineries scattered across the state. Many have been successful in selling their products outside of Michigan.